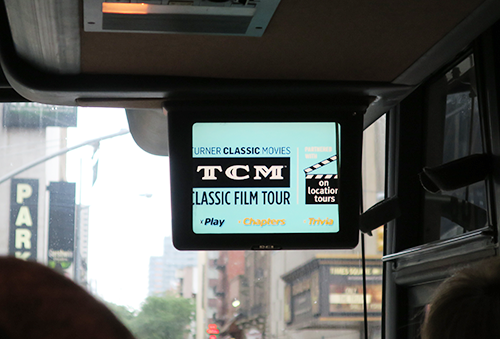 A couple weeks ago I had the pleasure of going on the TCM Classic Film Bus Tour in New York City. I'm a TCM Backlot member and they had a promotion a few months back where you could get the tickets, normally $49 each, for only $6! I got tickets for me and my parents, and the savings alone actually paid for my Backlot membership, so that was pretty cool! 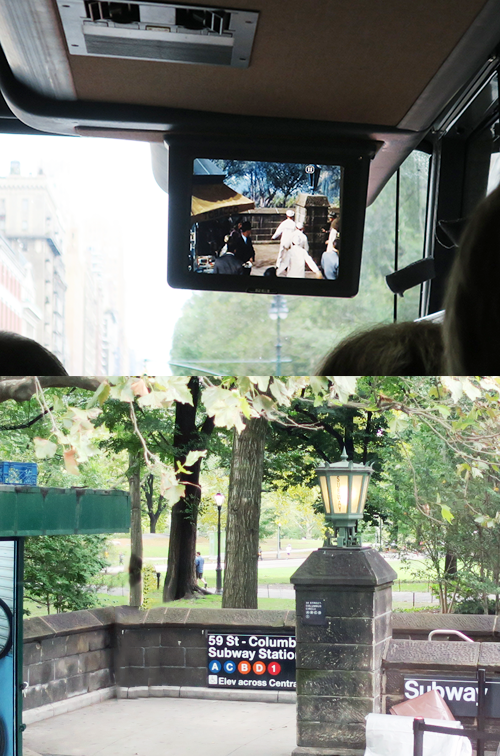 I had done the LA tour during the 2014 TCM Film Festival, but I was itching to do the New York one since it's more like "home turf" to me :) I couldn't help but compare/contrast while I was on the bus, but I feel like my own preferences and sensibilities definitely influenced my opinions. I like New York better than Los Angeles. I like that it's kind of rough and dinged-up and a lot of days in NYC are spent trying to figure out how to navigate around a local parade or avoid falling into an open construction site, lol! It's not as shiny and sparkly as LA, but I love that. It feels more homey and cozy. When you're in New York, it's more like you're actually in a movie while LA feels like you're on set. The tour bus in LA was TCM branded, had giant picture windows and a large flat screen tv in the front of the bus. The New York bus was a little worse for wear, was not TCM branded, and it had a sole travel-size-dvd-player screen for everyone to watch. But I liked it more. For one thing, our guide, Jason, was WAY better than our LA guide, who my friends and I nicknamed "casually sexist tour guide Mike" because of the way he flippantly inserted demeaning misogynist comments into so many of his film anecdotes. Jason was knowledgeable and clearly was a true classic film fan. 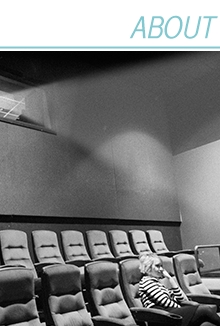 It was obvious that he was excited about the tour and film history, and his excitement was contagious. 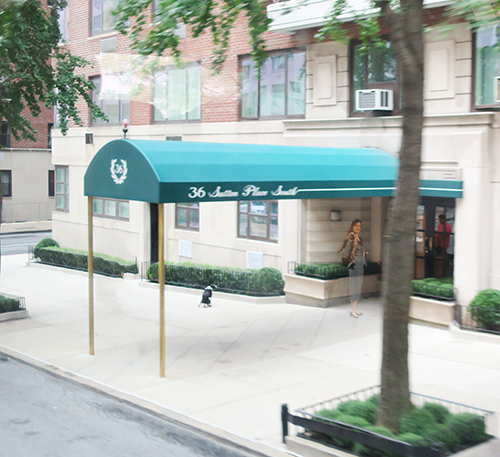 I found myself getting pretty pumped about locations for films I've never even seen, like Ghostbusters or Plaza Suite. The tour kicked off with the "New York New York" number from On The Town screening on the DVD player as we drove off to our first destination. Then Robert Osborne came on (the screen, not the bus, haha!) and spoke a little bit about which NYC films made him fall in love with the city and move there. He said that Woody Allen's Manhattan is his favorite New York film, which really caught me by surprise. I'm not a fan of that film at all, but I have to give it some credit now, I guess, if it has the Osborne seal of approval! Throughout the tour he'd ask the bus driver to pull over for a minute, at which point he'd play a clip from a film that was shot on the location we were stopped at. Above you can see On the Town playing on the DVD player while we were parked next to the subway stop in the movie. This is actually not the best example (it's just the only one where I happened to take a photo of the screen and the location!) because this scene from On The Town was actually filmed on a soundstage! They had tried to film on location here, but because Frank Sinatra and Gene Kelly were so popular, they had a difficult time getting work done with all of the crowds they were drawing! We made a couple of stops along the way, the first one being Zabar's, where You've Got Mail was filmed. I should mention here that I felt like the tour was kind of post-1970's heavy, so for any of those militant TCM fans who think classics stop at 1960 you might want to steer clear of this tour. There were definitely a decent amount of older film locations -- I'm going to list every film at the bottom of this post -- but most of the movies are post 1960. 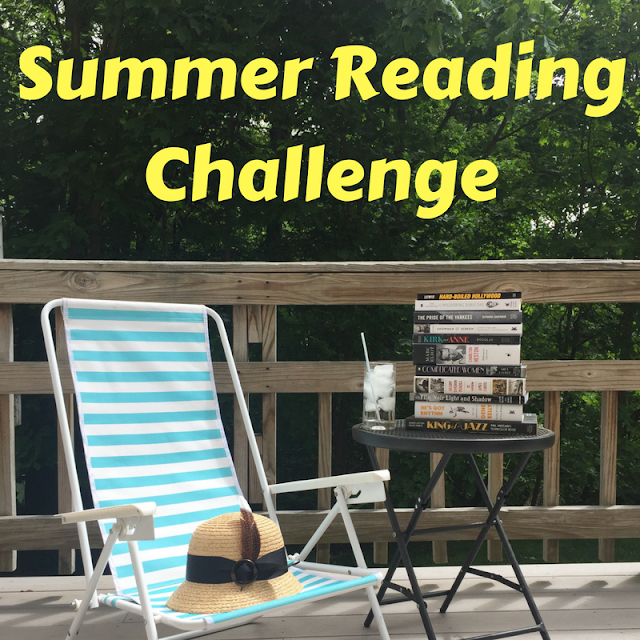 There were a lot that seemed like weird choices to me, actually, like Moscow on the Hudson and Baby Boom. I'd be the first to acknowledge that some of the more modern films (if you can even call them that when they're 20-30 years old already) are bona fide classics but those seemed like odd choices to me for a TCM Classic Film tour. Anyway, speaking of bona fide modern classics -- You've Got Mail. I love this movie (although I kind of hate how it ends!) 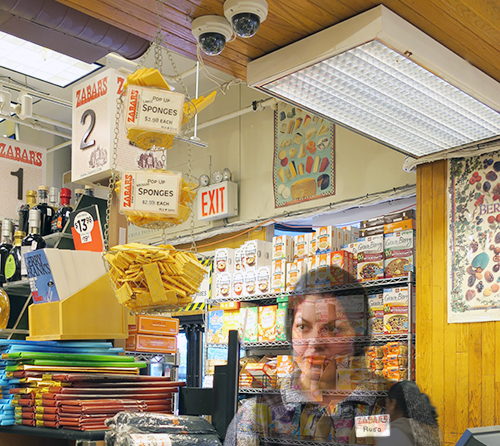 so I was excited to stop at Zabar's. This is where Meg Ryan gets in the "cash only" lane when she only has a credit card. 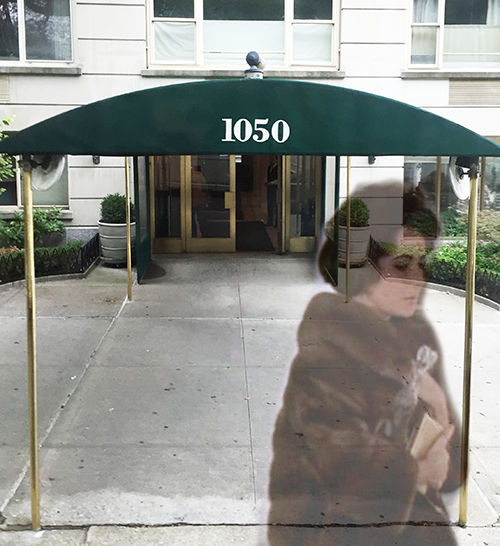 36 Sutton Place is where the girls lived in How to Marry a Millionaire! 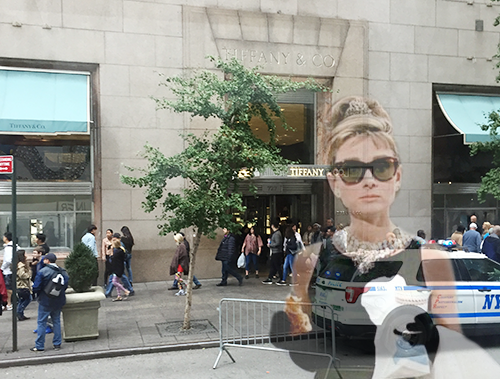 Of course we had to drive by Tiffany's! If I was in charge of the tour I think I would have come prepared with pastries and let everyone go stand outside the window for a little early morning contemplation a la Audrey Hepburn. Finally, we stopped at the subway grate where Marilyn Monroe took her iconic Seven Year Itch promo shots. I was wearing a mini skirt so this was my pathetic attempt at "doing a Marilyn" on the subway grate, haha! The subway grate actually isn't marked, there is literally no way to know it's even there unless you know the exact address (southwest corner of Lex and 52nd, the 2nd subway grate in from the street) before you go there. Apparently classic film fans are trying to get the city to declare it a historical landmark so that they can at least get a plaque for it, and I really hope that works out! My only complaint about this stop is that the bus parked in the spot where you'd have to be standing in order to get a photo from the same angle as Marilyn's original pictures. It's a small pet peeve though! Overall, I was incredibly pleased with the tour. I learned so many interesting facts about movie history in New York that will definitely be on my mind whenever I'm in the city now. 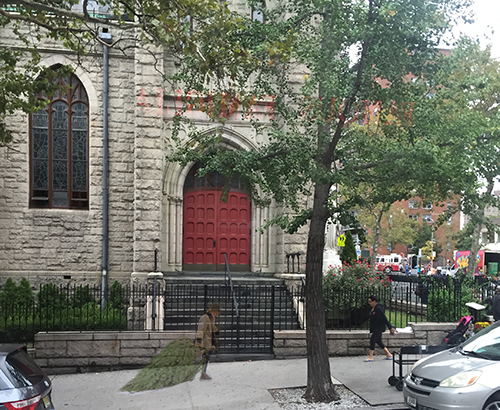 Did you know that tenement residents were evicted in order to build Lincoln Center in their place? Before it was torn down the city let the crew of West Side Story come in and shoot in the abandoned neighborhood. I thought that was so sad! Ideally I would love it if the tour was successful enough that they made one for Lower Manhattan (this tour only went through midtown and uptown) which is where I like to go whenever I'm in New York. I feel like there's a lot of material there, definitely enough for another tour! I'd also LOVE if they made a Paris tour. I couldn't stop talking about it to my parents after the tour was over. I started plotting out which movies I'd include, which locations, trivia to ask during the tour. 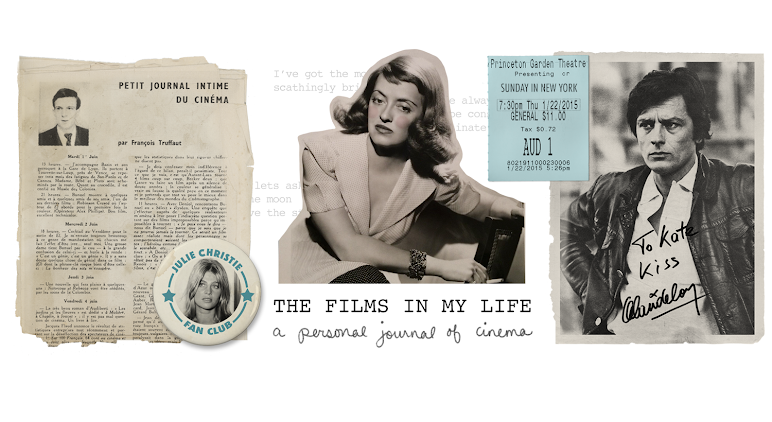 I almost want to write out a whole Paris tour and just send it to TCM with my fingers crossed that they'd take me up on it, haha! But right now we just have an LA tour and a NYC tour and I loved them both. If you love movies, I don't think the small things like bus branding or tv screen size will affect your enjoyment of the tour. The most important things are the locations, the information, and the tour guide, and the NYC tour excelled in all three departments. I'd actually do it again if the opportunity came up. I love that they included My Man Godfrey! Thanks for sharing this. I was curious about the NY tour. I'm thinking the LA tour is more my thing because of the movies featured, but I'm with you on that tour guide; I had the same one and he def. had a sleazy vibe.